Harold was a patient with metastatic bowel cancer - he had just months to live. Over his lifetime, he had been instrumental in transforming acres of farmland into the village that he grew to love. This legacy was extremely important to Harold. In an effort to keep this heritage alive, he had large posters made of photos, and he even used his carpentry skills to create an entire model of the town. Upon hospice visits, his only focus was teaching his caregivers about this legacy; he did not want it lost with his death. His caregivers began videotaping him sharing the story of his village – but that wasn't enough for Harold. With his permission, a local TV station was brought in, focusing on the model, photos, and the stories behind them. The TV personnel never mentioned that Harold was ill. The video aired on the local station, and Harold was ecstatic - and at peace. He passed away soon after, his legacy preserved. In this compelling recording, multiple case studies like Harold's will provide you with examples that you can incorporate when caring for the terminally ill. Caring for patients with end stage disease requires extreme sensitivity, deep compassion, and extraordinary knowledge. In order to deliver expert, holistic care, healthcare professionals need to have a toolbox full of new interventions to promote quality of life. 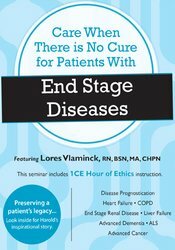 Each particular end stage disease has unique complexities for the patient, the family, and the healthcare professional - and this recording will cover specific strategies for caring for these patients. Did you know that a patient seeking a liver transplant can be on hospice care while waiting? We will discuss how this is done. What can we do for patients with COPD who's seemingly only solution for an exacerbation is a visit to the ER? We have an intervention for this. How can we keep costs down without sacrificing patient care? We’ll give you the latest strategies, proven successful in practice. Walk away from this recording with new tools for quality support - and care when there is no cure. Summarize the assessment scales that are predictive of poor survival. Explain the importance of prognosis and shared decision-making. Evaluate the benefits of using palliative care principles for patients with end stage disease. Distinguish palliative services vs. hospice services. Choose strategies to help patients overcome the fear of death. Predict challenging end of life symptoms and the best interventions. Pacemakers, ICDs & LVADs - Living better or prolonging suffering? Treating dyspnea: "The Pain of Non-Malignant Disease"
What do people want at the end of life? Does the dying person need hydration? Oxygen? Treatment for rales? Lores Vlaminck is a consultant for home care, palliative care, hospice, and assisted living providing education, training, mock surveys, and mentoring for staff development. Lores’ extensive professional nursing experiences span clinical practice in cardiac and intensive care, outpatient clinical services and as a founder/director of a Medicare certified home care/hospice director in greater MN. Her role in the 'trenches' gives her a unique understanding of the challenges and opportunities professionals and volunteers face in accompanying the patient and family facing a serious or life-limiting illness. Lores offers state and national education on palliative and hospice care and is certified trainer of the ELNEC (End-of-Life Nursing Education Consortium) modules, EPEC (Education on Palliative and End-of-life Care) modules and the HPNA's (Hospice and Palliative Care Nurses Association) curriculum. 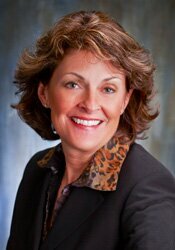 She is a member of MHCA (Minnesota Home Care Association), MNHPC (Minnesota Network for Hospice and Palliative Care), Leading Age MN, NHPCO (National Hospice and Palliative Care Organization), HPNA (Hospice Palliative Nursing Association-MN Chapter) and Sigma Theta Tau. Additionally, Lores also serves on two not-for-profit long-term care boards. Financial: Lores Vlaminck is Principal for Lores Consulting. She receives a speaking honorarium from PESI, Inc. Non-financial: Lores Vlaminck has no relevant nonfinancial relationship to disclose. This self-study course includes 1.0 hours of general ethics instruction. Not all boards allow ethics credit for self-study products. If ethics is not specified within your licensing board’s approval statement below, please contact your board to determine the applicability and amount of ethics allowed. Nurses completing these self-study materials will earn 6.3 contact hours. Expires: 11/30/2021. PESI, Inc., #1062, is approved to offer social work continuing education by the Association of Social Work Boards (ASWB) Approved Continuing Education (ACE) program. Organizations, not individual courses, are approved as ACE providers. State and provincial regulatory boards have the final authority to determine whether an individual course may be accepted for continuing education credit. PESI, Inc. maintains responsibility for this self-study course. ACE provider approval period: January 27, 2017 - January 27, 2020. Social Workers completing this course receive 5.25 Clinical Practice and 1.0 Ethics continuing education credits. No more than 6.25 total CE hours may be awarded for this self-study activity. Course Level: Intermediate. Full attendance is required; no partial credits will be offered for partial attendance. A certificate of attendance will be awarded at the end of the program to social workers who complete the program evaluation. Canadian Social Workers: PESI, Inc., #1062, is approved to offer social work continuing education by the Association of Social Work Boards (ASWB) Approved Continuing Education (ACE) program. Organizations, not individual courses, are approved as ACE providers. State and provincial regulatory boards have the final authority to determine whether an individual course may be accepted for continuing education credit. PESI, Inc. maintains responsibility for this self-study course. ACE provider approval period: January 27, 2017 - January 27, 2020. Social Workers completing this course receive 5.25 Clinical Practice and 1.0 Ethics continuing education credits. No more than total CE hours may be awarded for this self-study activity. Course Level: Intermediate. Full attendance is required; no partial credits will be offered for partial attendance. A certificate of attendance will be awarded at the end of the program to social workers who complete the program evaluation. Canadian provinces may accept activities approved by the ASWB for ongoing professional development.